Objective: To investigate the effect of mindfulness training on pain tolerance, psychological well-being, physiological activity, and the acquisition of mindfulness skills. Methods: Forty-two asymptomatic University students participated in a randomized, single-blind, active control pilot study. Participants in the experimental condition were offered six (1-h) mindfulness sessions; control participants were offered two (1-h) Guided Visual Imagery sessions. Both groups were provided with practice CDs and encouraged to practice daily. Pre–post pain tolerance (cold pressor test), mood, blood pressure, pulse, and mindfulness skills were obtained. Results: Pain tolerance significantly increased in the mindfulness condition only. 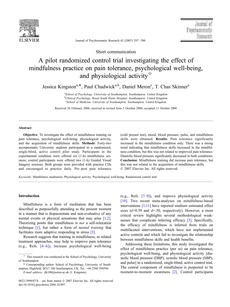 There was a strong trend indicating that mindfulness skills increased in the mindfulness condition, but this was not related to improved pain tolerance. Diastolic blood pressure significantly decreased in both conditions. Conclusion: Mindfulness training did increase pain tolerance, but this was not related to the acquisition of mindfulness skills.